In my, not so patient, wait to make Sourdough Bread with my new Sourdough Starter, I’ve decided to try homemade Sourdough English Muffins! I just couldn’t sit and look at that frothy sweet goodness anymore without incorporating it into something in my kitchen! 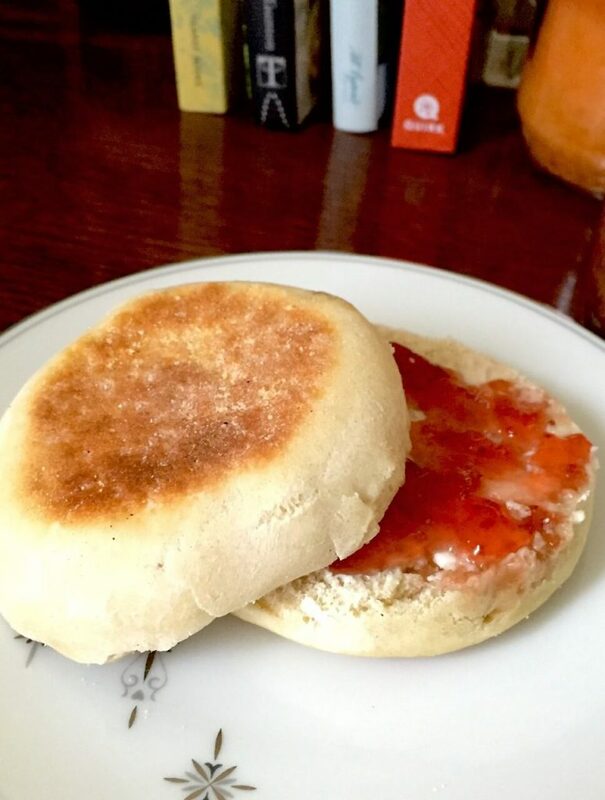 This week I made my first batch of Sourdough English Muffins, and they were a hit! The fun part of English Muffins is that they are made like pancakes, and not baked like your typical bread recipes. If you’re wanting these fresh for breakfast, I suggest making them on the weekend if anyone needs to get out the door for work. I made the mistake of attempting to have them ready for hubby during the week, and he was pretty bummed when they were just hitting the pan on his way out the door. Sorry, hubs! But I redeemed myself by having them ready with homemade butter and jam the next morning! I was forgiven… And asked not to buy English Muffins from the store again! That was an easy request to fill, considering how easy and amazing these English Muffins turned out to be! In a medium/large bowl combine your frothy starter with 2 cups of the flour and the milk. Stir to incorporate and cover with plastic. Add the remaining ingredients combine. 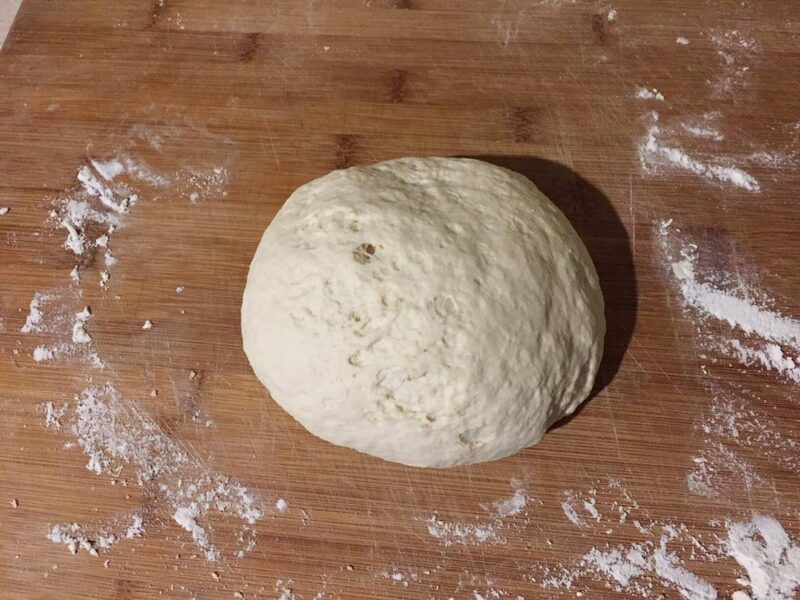 Place the dough on a lightly floured surface and knead (my favorite part !) for 4-5 minutes. Roll the dough out to about 3/4 inch. Cut out your muffins (I used the top of a glass that was about the right size, dusted with flour) and transfer them to parchment paper that has been lightly dusted with cornmeal. Allow them to rest for at least 45 minutes. This is the part that threw off my timing for hubby’s breakfast. Sorry again!! Before rolling out the remaining dough, allow it to rest for 10 minutes. Place the muffins in a skillet, preferably cast iron, preheated to medium heat. Cook on each side for 6- 8 minutes. I like to eat them fresh without toasting, but toast them before using if they have cooled off. Using every scrap of dough, I was able to make 10 full sized muffins and one tiny muffin (couldn’t let it go to waste). After these, store bought English Muffins will have no place in my kitchen! Allow them to rest for at least 45 minutes. This is the part that threw off my timing for hubby's breakfast. Sorry again!! This recipe was originally found on Jonesin’ For Taste! Stop in and check it out! is the 1/2 cup fed starter or unfed starter? I always feed my starter the night before I use it! 🙂 I hope you enjoy! You do not need to feed the starter to use it for this recipe. I’ve never done it and we make it all the time! I also use the unfed starter in sourdough pancakes and waffles! Thanks so much Katy! I’ll stop over! These were definitely a hit and I’ll be trying my hand at sourdough bread in the next week or two and be sure to share! I’m excited to try these! I got a starter last months, and working on perfecting bread, but always looking for other ideas as well! Tried making my own starter a few times and failed miserably! These look great! These look wonderful!! I keep seeing a gluten free version of sour dough floating around.. I need to just give it a try and try your recipe out!! Staci, these look awesome, and congratulations for being featured in the Homestead Blog Hop this week! I hope you’re having a super week! ?? Thank you so much! They are delish! I hope everyone enjoys them! 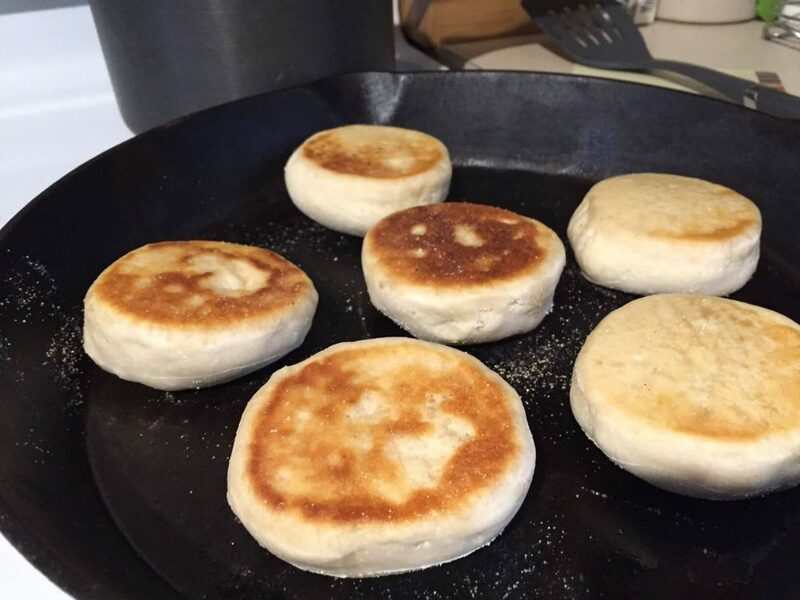 Like Katyskipthebag, I too, have been yearning to try making English muffins and sourdough. Decades ago, I got a starter, and used it all the time. Like I canned pressure canning and water bath, did my own tuna, and fruit and veggies, made my own bread, all with two kids under 10! Yikes, I did all that???!!!?? Anyway, I’m into my 60’s and terrified of doing it all again!!! One thing that stops me is gluten, my oldest daughter is gluten intolerant, and I know that grains aren’t what they used to be in even the 60’s-70’s, with all of the GMO’s, and fuddling around with nature… So I have heard that some ancient grains (still as God made them!!!) and also fermenting (sourdough) eliminate that issue, so will try this with those ingredients!!! That is amazing!! I strive everyday to be that woman! I really hope that this recipe is helpful to your daughter!! Please let us know when you try them! I love your recipe! It was an absolute success! I managed 12 muffins using my biscuit cutter. Had to turn my burners to low after preheating. This is my first try EVER at sour dough starter and sour dough anything! I’m such a believer. Trying pretzels this weekend! Yum! Thank you so much! They are a favorite here and I’m so glad they turned out well for you! You’ll love the pretzels too! Have fun! Oh I used to love english muffins at breakfast when I was a kid! I think sourdough would make them even better – what a great idea! Thanks for the inspiration. They are amazing fresh off of the skillet!! Oh Yum! I think I might have to give these a go next week! Found this today on the Homesteader Hop and glad I did! But then you know I’m a fan already. 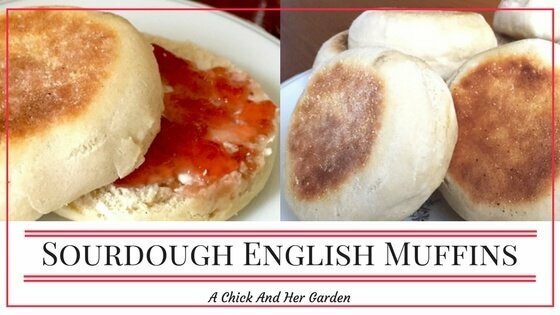 I’ve made English muffins almost exactly like these before, they’re awesome! They work great for eating on the weekend, and then quick breakfasts all week. If you have too many, they freeze really well after cooking. Followed here from the Homesteader Hop. I let them sit out on the counter! 🙂 I hope you enjoy! Amazing!I didn’t think I could do it!Kids loved it.I got up at 5 am to surprise them.We used a home made Christmas jam on them. I left mine out. If you live in a hot climate you may want to adjust the time. I live in a hot/humid climate and left mine out on the counter overnight. Worked great. Just came across this. Do you put anything in the skillet? Butter? Nope! Just the corn meal on the muffins! 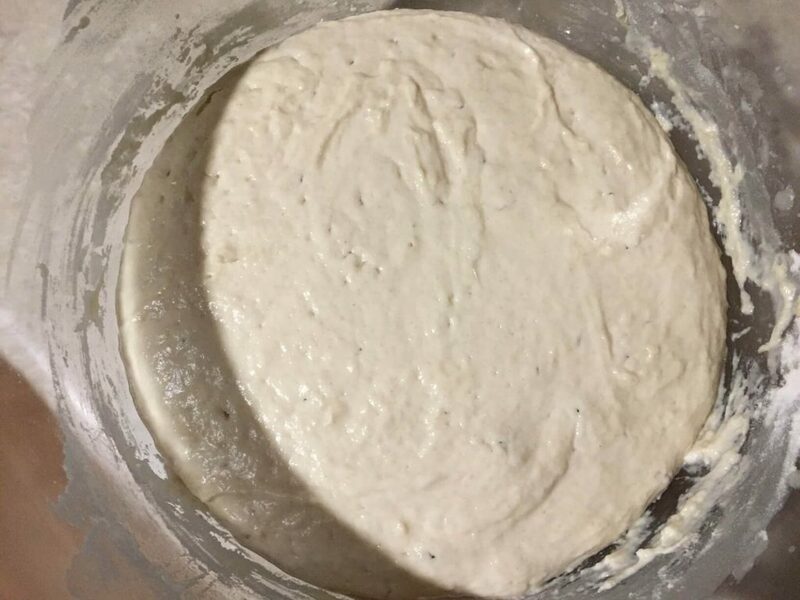 I am a newbie to the whole sourdough thing and started my first starter just a week ago. Found this recipe and tried it today. Oh man it reminds me of my childhood. I am originally from the UK but now live in Sweden where you can’t buy English muffins. This reminds me of my childhood. I am so pleased I put the effort in. They were yummy. These have great flavor but my dough was really wet. I wondered if it was because I tried to convert your recipe to metric with my scale. Do you happen to have the weights you used? Thank you. Do you think I could bake these instead? If so what temperature and how long? I just made these and they are FABULOUS!!! Yep, I will never buy store-bought again. These were easy, light, fluffy, and just plain delicious. Love your twist!! 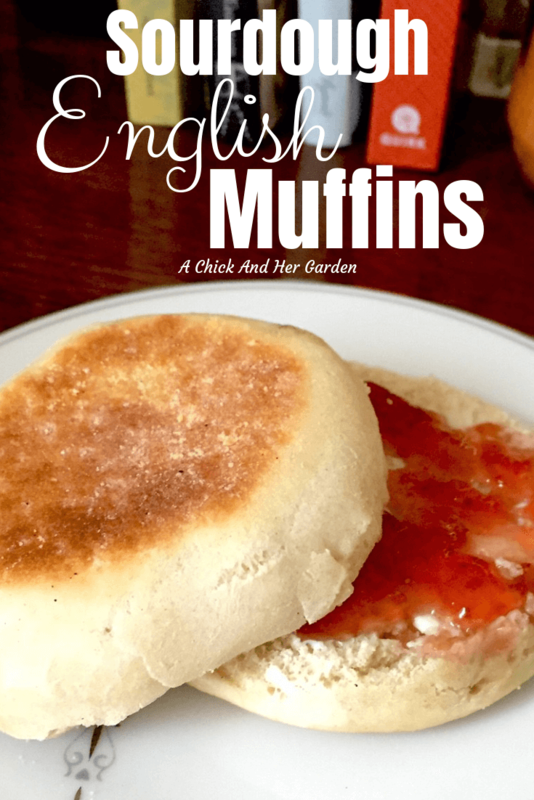 It’s another amazing way to make these English muffins disappear! !